Ideal-LIVING is excited to announce the 2018 Ideal Home – the first ever Ideal Cottage, located in the Rocky Mountains. The Red Ledges Ideal Cottage was chosen because it exemplifies the ideal lifestyle. For starters, it boasts outstanding amenities, incredible views, and stunning architecture. In the Heber Valley about 20 minutes from Park City, UT, you’ll find the Rocky Mountain private destination community of Red Ledges. 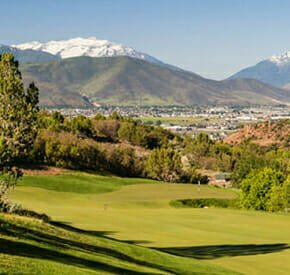 One of Utah’s finest treasures, Red Ledges’ Heber Valley setting is only a 45-minute drive from Salt Lake City and its international airport (a Delta hub – a great convenience for Red Ledges members). With a four-season climate that boasts amazing outdoor opportunities year-round, it’s easy to see why this picturesque valley has earned a reputation as the perfect place to live or vacation for all ages. Known for its pristine mountains, world-class ski scene, and miles of biking and hiking trails, the region offers boundless opportunities to enjoy Mother Nature’s majesties. Only minutes from the famed Deer Valley and Sundance ski resorts, Heber Valley boasts three state parks, a 2002 Olympic venue, and historic Heber City – named by Expedia as one of the 10 “Most Beautiful Towns in America” in June 2018. The region also offers a thriving arts community, headlined by the famed Sundance Film Festival. Park City’s international restaurant scene is complemented by Heber’s family-friendly dining options, and the Red Ledges Club has talented chefs closer to home. Red Ledges members get the best of all worlds: the excitement and thrills of a popular international destination, and a scenic, private place to get away from it all. Red Ledges started as the dream of a Fortune 500 CEO whose wife had grown up in the Heber Valley. The community’s first decade saw hundreds of families buy in to the Red Ledges vision: ecologically sensitive and prudent development, great amenities, and a location at the epicenter of outdoor fun. Golf is at the heart of the community, with a spectacular 18-hole Jack Nicklaus Signature Course (named by GOLF Magazine as the “Best New Private Course in America” in 2009) and the first ever 12-hole Jack Nicklaus Signature Golf Park. Other offerings include the Cliff Drysdale Tennis School (with programs by the U.S. Open doubles champion and ESPN commentator) and an on-site equestrian program with organized group and private trail rides, winter sleigh rides, and private horseback riding lessons. The Swim and Fitness Center offers a range of wellness opportunities – and a new resort-caliber pool and aquatic playground will debut in 2019. The Red Ledges Club’s activities are coordinated and curated by a “Director of Fun,” who adds insights, service, and convenience on all the fun stuff. The real estate opportunities in Red Ledges include a variety of master-planned options for retirees and vacationing families. Carefully designed neighborhoods offer estate homesites, luxury cottages, mountain villas, and club cabins. The Ideal Cottage was designed and built to take advantage of the amazing views of Mt. Timpanogos. With the cottage’s three bedrooms (all with en suite baths) adjoining copious upstairs and downstairs social spaces, the Ideal Cottage’s 3,269 square feet are perfect for family getaways. The outdoor living spaces are truly ideal, with stunning spaces including a fire pit to enjoy cool evenings. The new Red Ledges Construction Company is building that plan and others in the Ideal Cottage’s neighborhood along Kings Peak Court. Red Ledges Construction is headed by Rex McGuire, newly hired as Red Ledges’ Vice President of Operations, who brings vast experience to the construction management team. McGuire has been in the home building industry for the past 20 years, gaining building experience in development and operations, including construction management, land planning and development, product development, customer service, and green building technology. The 2018 Ideal Living Cottage at Red Ledges was designed and built under the supervision of the Red Ledges Construction Company. Headed by industry veteran Rex McGuire, Red Ledges Construction is the most active homebuilder in the 2,000-acre community, where there are currently over 100 homes, cottages, cabins, or villas being built or in process (to add to the total of nearly 200 completed overall). A wide and talented range of subcontractors were managed by Keith Van Dyke, as well as by Red Ledges Construction’s Kelly Cook and Greg Adamson. Red Ledges thanks all involved for their hard work and the great result of the cottage!